Does anyone out there know how much area is covered by images that are taken from a balloon or kite? I know that the area will be different depending on high you are flying, but if anyone knows sizes at different altitudes, I would love to have that information. I am planning a citizen science project in the Linville Gorge, NC to map the gorge's invasive species and target them for removal and treatment and I am trying to plan how many locations we will need to visit to map the whole gorge. The area of ground covered by an aerial photograph depends on both the height of the camera and the focal length of the lens. Lenses typically used for kite and balloon photography will cover a rectangular area with one dimension approximately equal to the height of the camera above the ground. 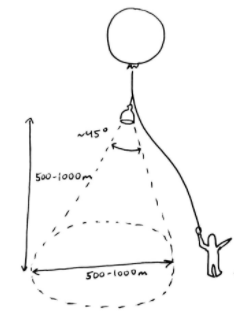 So a Canon PowerShot with a focal length of 24mm (35mm equivalent) flown 300 feet high will capture a rectangle 300 feet by 450 feet. A Canon PowerShot with a focal length of 36mm (equiv) flown 300 feet high will capture a rectangle 200 feet by 300 feet. The PowerShot S100, S110, and S120 have an equivalent focal length of 24mm at the widest zoom. The PowerShot A495 has an equivalent focal length of 37mm at the widest zoom. Most point and shoot cameras are somewhere between these extremes. That's the same measure I always adopted. For 100m above the ground level, 100m coverage at the smaller side of the picture. Most camera lenses have a viewing area angle close to 90 degrees, but often less, I.E. 70 degrees or so. Imagine your viewing area in two dimensions as an isosceles triangle with the camera's viewing angle as the top angle of the triangle, and your viewing area as the base. Mathew, that diagram is a little misleading. A lens with a 45° field of view (focal length of 44mm equiv.) would capture a photo with a long side equal to 82% of the camera height. Most point and shoot cameras can be zoomed into 44mm and that would improve resolution. But most Powershots have a lens with about 24mm to 37mm focal length widest zoom which produce 74° to 52° field of view (respectively). In your Answer text I think you meant 45° not 90°, but the proper range is about 52° to 74°. Yes, thanks, Chris! I was focusing on finding the right image, not getting the right numbers in.